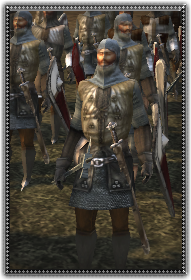 This levy unit comes from the class of merchants and city commoners who are able to afford additional armor. For levies, they are proud soldiers. They carry a Venetian style war hammer influenced by frequent trading in the Mediterranean. Eager and capable, these men are best used to assault enemy ranks. Able to afford good amour and using a Venetian influenced war hammer, these are capable assault infantry.